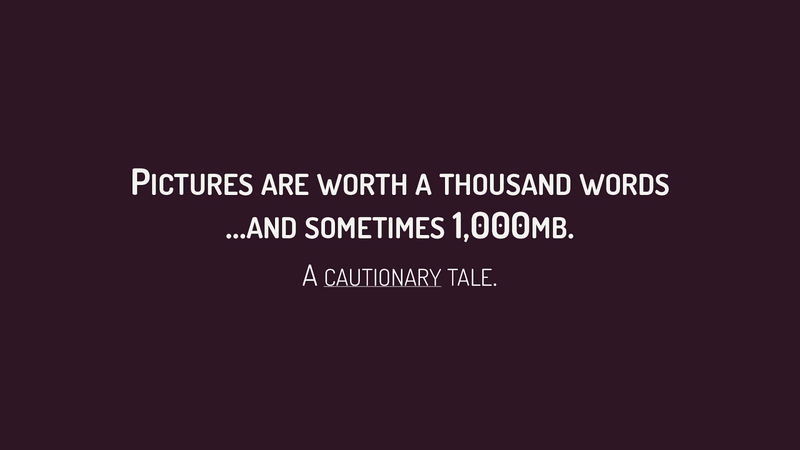 PICTURES ARE WORTH A THOUSAND WORDS …AND SOMETIMES 1,000MB. A CAUTIONARY TALE. BBC has seen that they lose an additional 10% of users for every additional second it takes for their site to load Rebuilding Pinterest pages for performance resulted in a 40% decrease in wait time, a 15% increase in SEO traffic and a 15% increase in conversion rate to signup. 🖼 Can image be vector? NO Does it need transparency? YES YES SVG PNG NO NO YES JPG COMPRESS RESIZE WEBP Is the image complex? View Pictures are worth a thousand words…and sometimes 1,000MB. A cautionary tale. on Notist.